View The Dyno Session Here! Sorry, This Ain't The Engine Out Of Your Daddy's Lincoln. No Sir, This BBF Is Packed With All The Latest Go Fast Parts That You Could Ever Wish For. Ford Motorsports Block, Lunati Crank, Molnar Rods, JE Pistons And AFR 315 Bullitt 14° Heads. 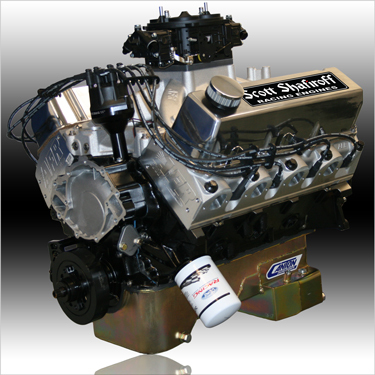 Add The Magic Machine Work And Assembly At Shafiroff Racing And You Have A Proven Winner Here. Toss In A Comp Cams Custom Hydraulic Roller Cam With High Rev Lifters And You Have A True Street Masterpiece! Available With Canton Oil Pans To Fit Almost All Ford Car And Truck Chassis. Now, It's Not Just The Chevy Boys Who Can Have "Big Block Power" In Their Street Toys. Giddy-Up Boys And Girls! (1) Specify Front or Rear Sump at time of order. (2) Neutral Balance Flexplate/Flywheel Required. Includes: Holley Super Sniper EFI Unit, Sniper EFI Touchscreen LCD Programmer, Bosch LSU 4.9 Wideband Oxygen Sensor, Stainless Steel Clamp-On Oxygen Sensor Installation Kit (May Also Be Welded), Hyperspark Distributor and SSRE Custom Ignition Wires w/Looms. Base Tuneup and Parameters Set and Calibrated on Your Engine.